The road, known as the “grapevine,” snakes through the mountains between Los Angeles and Bakersfield. The thoroughfare was closed early on Saturday evening, and only re-opened about 90 minutes before midnight, according to KPIX-5, the local CBS News affiliate in the Bay Area. The entire state has been hit by rain and snow over the past several weeks, as winter storms have arrived somewhat unexpectedly. Forecasters had predicted a dry winter, thanks to the condition known as La Niña, which typically follows an El Niño pattern. Last year’s El Niño brought rain to Northern California but left Southern California dry. 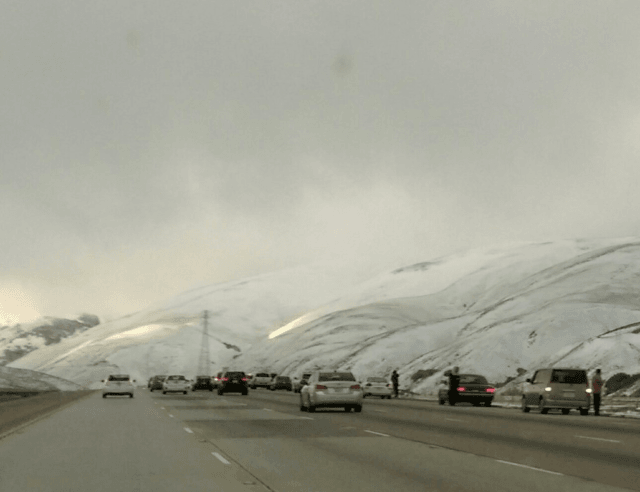 This year’s storms have already drenched Southern California — and have brought snow to the surrounding mountains as well. That has residents hopeful that a five-year drought may finally be broken. Drivers, however, were less happy. “It’s terrible nobody here knows how to drive in snow,” one driver from Washington told CBS Los Angeles. Small amounts of snowfall — such as the three-to-six inches forecast for the area — that would not stop traffic in other parts of the country often bring driving to a standstill in California, where public authorities lack snow plows and drivers do not typically use snow tires or carry snow chains. Saturday also saw a 30-car pileup near Bakersfield in a crash that left at least two drivers dead, according to San Diego’s 10 News. The accident was apparently unrelated to the weather conditions.